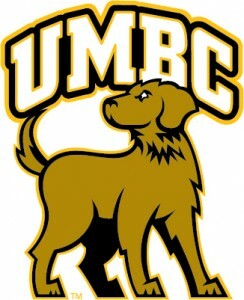 The official UMBC athletics logo consists of a stylized Chesapeake Bay Retriever with an arched “UMBC” over its head. Its use – and all variations of the athletics brand – are limited to athletics materials and merchandise sold in the bookstore. It may also be employed for special occasions, such as Commencement and Convocation ceremonies. 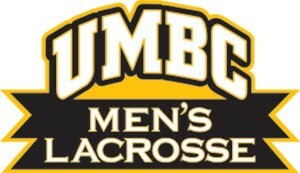 It should not be used by academic programs in place of the official “UMBC: An Honors University in Maryland” wordmark. It should not be modified in any way. Understanding that the honors wordmark has limitations online, you can use the appropriately typeset “UMBC” without the tagline in cases where the tagline would not be readable. UMBC’s mascot, the Chesapeake Bay Retriever, and its characterization, True Grit, are important parts of our campus culture and history. Students, alumni, faculty, and staff refer to themselves as “Retrievers” with a great deal of pride. The Chesapeake Bay Retriever, as a breed, exhibits a number of qualities found in UMBC’s students and alumni. They are extremely hard-working; sensitive and serious; and intensely loyal and protective of those they’ve grown to love. Language and imagery related to the “Retriever” is woven throughout a variety of campus communications, on websites, print pieces, letters, signage, clothing, and more, including the campus magazine. While the Retriever image, logo, and related Athletics marks are linked to many aspects of UMBC life, they should not be used to represent academics at UMBC. Consider, instead, using photographs of students, the library, the Honors logo, etc., to represent the academic element of the UMBC experience. For more information about proper use of the athletics logo, see below. No member of the UMBC community stands alone. When we use images of the Retriever statue, we should display it in a way that reflects our community. For instance, instead of displaying an image of the statue alone, it might include members of the community surrounding it. This variation is the preferred option for all communications, apparel, environmental graphics, and stationery (letterhead, business cards, envelopes, etc.). Please note that when this logo is placed on a gold background the outer gold edge should be changed to white. When using the primary logo in black (single color), please make sure the outer edge is represented (shown here with a thin outline). There are single color alternatives available for each logo variation. Please contact UMBC’s Creative Services with any special retriever logo requests. A wordmark variation has been created for each NCAA Division I sport the Retrievers participate in. Individual sport wordmarks should be used in a secondary (smaller) role when used in combination with the primary logo. If you need a sport wordmark, please contact Creative Services. The Creative Services department is always available to offer a professional opinion if there is some question about which variation should be used for a particular project. Designers should strive for readability of all elements (the white of the eye, the UMBC, and the TM) when using the Athletics logo in their work. They should also avoid placing the retriever marks too close to other logos. A 1/2″ (half inch) of clearance around the logo is recommended. 4) DO NOT: Change the orientation of the mascot. The mascot’s gaze was designed to face the competition in a normal Home vs. Away display of logos (where the home team is on the right). The UMBC Retrievers wordmark can be changed to include department names. If you are interested in a mark like this (see below), please contact Creative Services.